A major problem facing law enforcement today is the prevalence of cell phones being smuggled into jails, prisons and correctional facilities. These phones pose a great risk to these institutions because the they can be used for a variety of dangerous measures, including running gang activity and coordinating escapes. 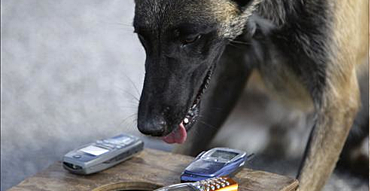 Canines are now being utilized to detect cell phones, making them the most effective means of combating this problem. Recently following a new law making it a felony to smuggle cell phones into prisons, K-9 SEARCH & DETECTION, LLC provides Departments of Corrections with K9s trained in cell phone detection. Currently, K-9 SEARCH & DETECTION, LLC has several canines that are being trained for this purpose, along with many drug detection dogs that are also being used in prisons. Please feel free to learn more about our services by completing our Request for More Information form.